* Note, each kit contains two pistons and seals. The TRX300 4X4 has two cylinders per wheel. Older 2X4 machines have one wheel cylinder with two pistons. 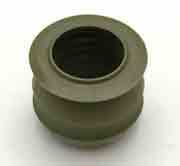 Includes pistons, cups and boots for all models and springs and bleed cap when applicable. Wheel Cylinder Rebuild Kit. Includes Pistons, cups, boots and springs and bleed cap when applicable. Aftermarket Radiator Fan. Saves you big bucks over OEM. Blade Diameter: 9" Mounting Hole and Housing Diameter: 9-3/4"
Can be adapted to work on Kawasaki Mule 3010 and replace 59502-1137. You would have to cut out original fan, mount to the existing metal housing and splice the wires. Sportsman 500 2004 Model Code - A04CH50AO/AQ/AR/AS/AT/AV/AW/AX 11"